40 cards from a standard 52-card deck: A through 10 of each suit (remove jacks, queens, kings and jokers). Each player is allocated one of the four suits. The first person whose 9 is removed from the layout is the winner. A deck of 36 cards (running A through 9 in all 4 suits) is shuffled, cut and stacked face down in the center of the table. The four tens are then shuffled and one is dealt face up to each player. If there are fewer than 4 players, each player is dealt one 10 and the rest are put aside. The 10 each player holds determines which will be their suit. All players know which suit belongs to each player. 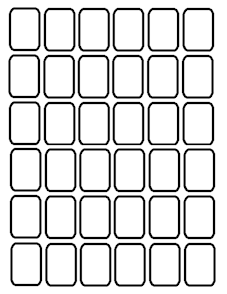 The 36 cards are then laid out face-up to form a complete grid of 6 by 6 cards on the table, as shown on the right. The player to the right of the dealer starts. The direction of play is counterclockwise. At your turn, you must move one of the nine cards that belong to your suit vertically or horizontally to an adjacent place (no diagonal moves). If that place is already occupied by a card, the card must be of a different suit and lower than the card you are moving, otherwise the move is not allowed. When a card is moved to an occupied place, the card that was previously in that place is removed from the grid and set aside. When a card is moved to an empty space, no card is removed from the grid. A player who has a card on the edge of the grid may use their turn to move it off the grid and set it aside, but only if it is the lowest card of their suit on the grid. So at the start of the game the only card that can be moved off the edge of the grid by its owner is the ace. When the ace is gone, having been moved off the grid by the owner or replaced by an opponent moving a higher card onto its place, then the two can be moved off, and so on up to nine. Each player moves just one card one space in their turn: then it is the turn of the next player. The first player whose nine is removed from the grid wins the game. Sometimes a player cannot make a normal move because all their cards are surrounded by cards of their own suit or by equal or higher valued cards of other suits, and the player's lowest valued card is not on the edge of the board. In this case the player must choose one of their cards that is adjacent to at least one opponent's card, and move it to the place occupied by the lowest valued adjacent opponent's card, removing that card from the grid. If there is a tie for the lowest value, the player chooses which of those places to move to. This game can involve a lot of strategy and it may take a while for each player to plan each move, or it can be a very quick game. The players must take into account that when they replace adjacent cards with their own to create space and move forward, they are also decreasing the number of cards that an opponent needs to remove from the table in order to win. Obviously, the more cards a person has near to the edge at the beginning of the game the closer the person is to winning. Taking into account that aces cannot replace any other card in the game, you must first clear a passage for your ace to reach the border, otherwise none of your cards can leave the board except with the help of your opponents. This same game can be played in solitaire form. The player's suit is spades and the objective is to remove the 9 of spades from the grid using as few moves as possible. The minimum possible score is 9, if all nine spades happen to be on the border of the grid.